3-star-hotel in the 12th district of Budapest. Address: 1124 Budapest, Jagelló u. 38. The hotel has 24 rooms. 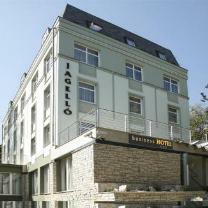 Air-conditioned Jagello Business Hotel is situated at the BAH junction, next to the Budapest World Trade Center and MOM entertainment plaza, near by the downtown with excellent public transport facilities, in a peaceful environment. Airport: 25 km km >> Order your transfer! The 3-star Jagello Hotel - opened in 2006 - offers 24 modern, comfortably furnished double rooms with central heating and air conditioning. The rooms have sound-proof windows, smoke detector, private shower and toilet (including hair-dryer), satellite television, direct dial telephone and minibar. In the breakfast room they offer buffet breakfast from 7:00 until 10:00. Half board (lunch or dinner) can be required. The hotel is a highly recommended place for traveling businessmen. Their purpose is to ensure a comfortable, quiet and efficient environment for leisure and working (telephone, free Internet access, fax, etc.). Having access to the green area garden, the conference-room is equipped to receive up to 30 persons for private company reunions, as well as trainings or courses. The hotel garage can accommodate 15 cars. There are further parking places for cars and buses in the vicinity of the hotel. The receptionists give local information in more languages (Hungarian, German, English, French and Slovakian) 24 hours a day. The most important sights and the business centre of Budapest can be reached in 15-20 minutes from the hotel. The guests can reach Buda Castle in about 20 minutes. The Buda Hills are the green area of the capital offering popular places for nature-lovers and walkers. There are designated paths through the forests that are suitable for both walking and cycling. The Sas Hill, situated near the hotel, is a 74-acre nature reserve with botanical and zoological interests.